Bulk material handlers in all industries rely on scales to weigh their products and accurately determine quantities during packaging, before shipping, or before storage in a facility. Many bulk products are sold or distributed based on weight, so it is important that precise information is available. Scales can be small enough to measure tiny objects, but typically in bulk material handling applications, they are at least large enough to weigh a loaded pallet. Some industrial scales are large enough to weigh an entire loaded trailer or shipping container. 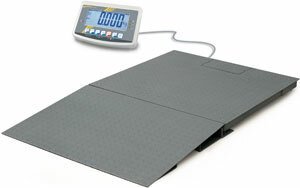 Scales are made in many different forms, including: bench scales, hanging scales, and platform scales. A bench scale is raised up off of the ground by several inches or a few feet and may even be moved around a facility as needed. The raised stance of the scale makes it easier to load and unload small to medium sized loads. A platform scale or floor scale is level with the floor and typically has a large platform for weighing large bulk loads. A forklift or other vehicle can be used to move the weight directly onto and off of the scale. A hanging scale suspends loads in the air and gauges their weight based on the amount of gravitational force that they exert. Scales can have either digital or analog readings. While a scale with a meter and a needle that displays the weight of a load may be accurate, it is not as precise or as easy to read as a digital scale. Digital scales show decimals and make it possible to be highly precise during the weighing of bulk products. In any bulk operation, the most important consideration when investing in an industrial scale is the maximum weight that it is able to measure. 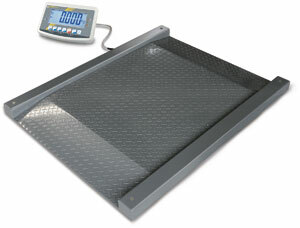 Scales can range from a capacity of just a few grams to over 80,000 pounds. Knowing the needs of your application and choosing a scale accordingly will prevent technical errors and allow for the accuracy that your system needs. When bulk products are weighed on a scale, they are usually on a pallet or loaded into some kind of container. The weight of the container or pallet itself can be inputted into the scale so that the only material being measured is the bulk material. If distributors are being charged by weight, it is important that a bulk handler does not also charge them for the weight of the container. Industrial Drive-Through Scale – PCE Americas, Inc.
To determine the weight of a load, scales are built with hydraulics, balances, springs, or load cells. In more complex scales, a combination of these devices is used. In most industries, scales are subject to regulatory standards that have been established by the National Institute of Science and Technology. These standards ensure worker safety and accuracy for the measurement of bulk goods. In a bulk material handling system, scales can be placed near other equipment and loaded manually by workers, or they can be loaded and unloaded intermittently by automated machines. In these instances, the machines receive information from the scale that tells them when the load has reached the required weight. Bulk material handling systems in agriculture, food processing, pharmaceuticals, and more all use industrial scales to weigh products before they are packaged or shipped. Sometimes it is necessary to use scales to weigh small quantities that are then added to a larger mixture in a processing plant. Again, accuracy is key to maintain consistency and quality across bulk products in applications like these.